HarÄ«sa is the most important condiment used in Tunisian cooking, and, in fact, you need to make this recipe and keep it in the refrigerator before attempting any other Tunisian or Algerian recipe. It's hard to believe that so essential a condiment could evolve only after the introduction of the New World capsicum to Africa. HarÄ«sa comes from the Arabic word for Âto break into pieces,Â which is done by pounding hot chiles in a mortar, although today a food processor can be used. (By the way, harÄ«sa (Ú¾ïº®ï»´ïº´ïº) is spelled with one Âs,Â not two). 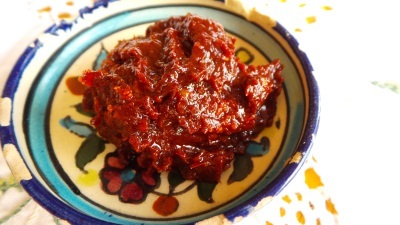 This famous hot chile paste is also found in the cooking of Algeria, Libya, and even in western Sicily where cÃ¹scusu is made. In Tunisia it would be prepared fresh in a spice shop. The simplest recipe is merely a paste of red chiles and salt that is covered in olive oil and stored. HarÄ«sa is sold in tubes by both Tunisian and French firms. The Tunisian one is better, but neither can compare to your own freshly made from this recipe. I first became intrigued with making harÄ«sa from a preparation made by Mouldi Hadiji, my Arabic teacher of more than 30 years ago. I concocted this version, based on a Berber-style one I had in Djerba, from a recipe description given to me by a merchant in the market in Tunis, who unfortunately provided measurements that could last me a century (calling for fifty pounds of chile). Some cooks also use mint, onions, or olive oil in their harÄ«sa. I modified the recipe after much consultation with an illustrious group of opinionated people including Chef Moncef Meddeb, Mohammed Kouki, the doyen of Tunisian food experts, and cookbook authors Paula Wolfert, Martha Rose Shulman, Nancy Harmon Jenkins, and Deborah Madison. Be very careful when handling hot chiles, making sure that you do not put your fingers near your eyes, nose, or mouth, or you will live to regret it. Wash your hands well with soap and water after handling chiles. After you make your first harÄ«sa, with all the modern conveniences, I hope you can appreciate what exacting women's work this was, making it in the traditional mortar. If you would like to read more about how the chile made the voyage from the New World to North Africa see my article on the diffusion of the chile. 1. Soak the chiles in tepid water to cover until softened, about 1 hour. Drain and remove the stems and seeds. Place in a blender or food processor with the garlic, water, and olive oil and process until smooth, stopping occasionally to scrape down the sides. This will take a few minutes. 2. Transfer the mixture to a small bowl and stir in the caraway, coriander, and salt. Store in a jar and top off, covering the surface of the paste with a layer of olive oil, to protect it from bacteria. Whenever the paste is used you must always top off with olive oil making sure no paste is exposed to air, otherwise it will spoil. Variation: To make a hot harÄ«sa, use 4 ounces dried guajillo chiles and Â½ ounce dried de Arbol chiles. To make salsa al-harÄ«sa, that is, harÄ«sa sauce, used as an accompaniment to grilled meats, stir together 2 teaspoons harÄ«sa, 3 tablespoons olive oil, 2 tablespoons water and 1 tablespoon finely chopped fresh parsley leaves.